Horses only spawn in the Plains Biome. To spawn horses in creative mode use the brown spawn egg. 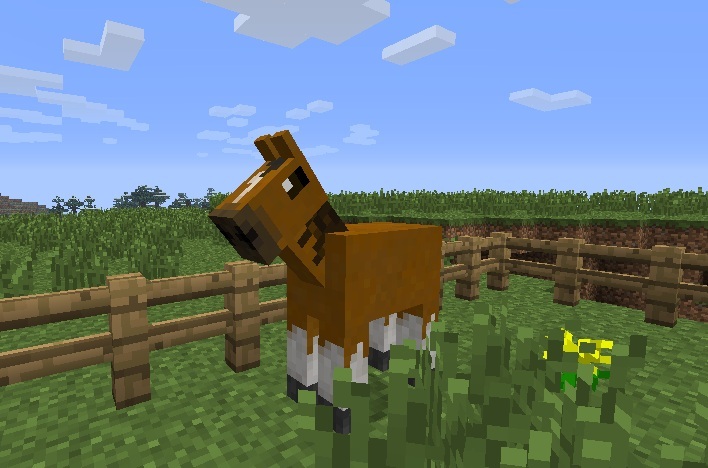 Horses generated by the Game are wild Horses. You can tame them with red apples. But be careful, they speed away if you come to close! Tipp: Riding an already tame horse you are faster than wild horses! But even tame horses don’t follow you like a dog, you have to either ride them or lure them with an apple. Wilde horses have dark brown legs and an eel back (dark line on the back). Tame horses have white legs and a white mark on the head. Only tame Horses follow the Player if he is holding a red apple. You can mate horses with red apples. Only foals from tame Horses are tame. Saddling the Horse: right click with Saddle on a tamed horse. To get the saddle off right click with an empty Hand. To mount/dismount the horse right click with something in your hand (but no red apple, that will get the horse into love mode). The horse can be ridden in 4 different gaits, even backwards! To steer the horse while riding, tap W (you don’t have to hold it down) to make the horse faster, tap S to slow it down/go backwards. Holding down A and D turns the horse. You don’t need a carrot on a stick to steer them. The horse will jump two blocks high if you press space. Be careful: A Horse doesn’t like going into the water while ridden. It gets very stubborn and you have to dismount it. The horse also may disobey you if it has been ridden recently. Just show it a red apple (you don’t have to feed it) and as soon as it follows you, you can mount it again. It now will do whatever you want. Wild Horses have Health 15, tamed ones have 20. Horses drop 0-2 leather on death. Don’t forget to delete the META-INF folder! Copy everything from the “put content into .minecraft recources” into the recources folder (into .minecraft/recources NOT the jar-file or .minecraft/bin!!!) Otherwise you won’t have the horse sounds.